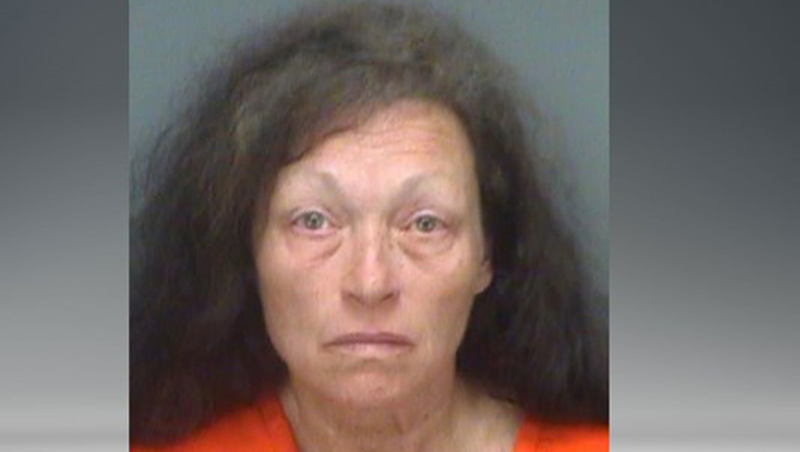 ST. PETERSBURG, Fla. -- A 62-year-old Florida woman is charged with aggravated manslaughter and neglect after authorities said her 6-year-old son beat his newborn sister to death while the children and their 3-year-old brother were left alone in the family's minivan. During a news conference Thursday, Pinellas County Sheriff Bob Gulatieri said the baby - 13-day-old Kathleen Bridget Steele - was pronounced dead Monday afternoon at St. Petersburg General Hospital. But investigators believe she died earlier, inside the van where her mother, Kathleen Steele, had left the children for 38 minutes while she visited a cellphone repair shop. "It was one of the worst things I've ever seen," the sheriff said. The newspaper reports Steele and her husband appeared on an episode of "I'm Pregnant and..." -- a Discovery Fit & Health reality TV show about women who face serious obstacles while pregnant. Steele's episode, which aired in 2009, was entitled, "I'm Pregnant and 55." Steele's husband died of cancer in 2011 at age 66. Deputies say the two youngest children were born through artificial insemination, using the deceased husband's frozen sperm. Steele had been raising the children alone. The Tampa Bay Times reports Steele took the baby to a pediatrician Monday morning because she wasn't eating properly. The doctor found nothing wrong with the baby and later told investigators there were no signs of bruising or trauma. Investigators say Steele went into the cellphone store at 1:50 p.m. Monday. The 6-year-old boy told investigators the baby started fussing and he tried to calm her. But deputies said the boy later used a doll to show how he repeatedly slammed the infant's head into the minivan's ceiling, dropping her on the floor, flipping her over and pummeling her. "The way he was describing it is he was tossing that baby around like a ragdoll," Gualtieri said, according to CBS affiliate WTSP. According to investigators, when the mother returned to the van, the boy tried to tell her something was wrong with the baby. They said she disregarded him and stopped at another business, reportedly staying there for about a half hour, before going home. That's when she noticed the baby's injuries. "The baby was beaten and traumatized," the sheriff said. "There was gross swelling in her face. Her skull was cracked in numerous places." Even so, Gulatieri said Steele didn't call 911. Instead, she called a neighbor who is a nurse. The nurse recognized the baby was dead, but performed CPR until paramedics arrived. Investigators interviewed Steele Monday night. The sheriff said during the first hour, Steele never asked about the baby and even seemed aloof. He said Steele said, "I guess I have to plan a funeral." Gulatieri said the boy will not face criminal charges. "The mistake is with the adult Kathleen Steele, not a 6-year-old boy," Gulatieri said. Steele was already being scrutinized by child protection investigators, Gulatieri said. Just three days after the girl was born, an accidental fire forced the family to stay in a hotel July 29, he said. When the fire alarm went off, Steele told deputies she put the baby in the car carrier but tripped going down the stairs and the baby tumbled out, striking her head. The baby was diagnosed with a minor brain bleed and stayed for two nights in the hospital, according to Gulatieri. A report was made to the child abuse hotline. Steele was scheduled to be evaluated by investigators Aug. 1, but she canceled and rescheduled. "I'm 100 percent confident there's nothing else we could've done or should've done. We couldn't have prevented this from happening," Gualtieri told WTSP. On Monday, Steele's sons were placed into therapeutic foster care. Steele is being held on $100,000 bond. It's unclear if she has an attorney.